The Vijayanagara Empire is a South Indian empire based in Deccan. Established in 1336, it lasted until 1646 although its power declined after a major military defeat in 1565. The empire is named after its capital city of Vijayanagara, whose impressive ruins surround modern Hampi, now a World Heritage Site in modern Karnataka, India. The writings of medieval European travellers and the literature in local vernaculars provide crucial information about its history. Archaeological excavations at Vijayanagara have revealed the empire's power and wealth. 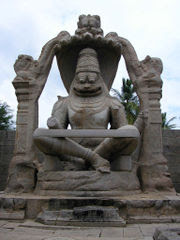 The empire includes many monuments spread over South India, the best known ones being at Hampi. The temples were an inspire architectural innovation of Hindu temple construction, first in the Deccan and later in the Dravidian idioms using local granite. Efficient administration and vigorous overseas trade brought new technologies like water management systems for irrigation. The empire's patronage enabled fine arts and literature to reach new heights in the languages of Kannada, Telugu, Tamil and Sanskrit, while Carnatic music evolved into its current form. The Vijayanagara Empire made such an impact in South Indian history that promoted Hinduism as a unifying factor.